This split bust by Lorenzo Quinn can be found at Halcyon Gallery on New Bond Street. So Frieze Art Fair has left town and that marks the end of Frieze week, but there's still plenty of great art to see around London. Many of the shows that were on during Frieze week have weeks or months still to run, including plenty across Fitzrovia and Mayfair. We've put together a guided walking tour of the best shows to catch. The best news is that they're all in commercial galleries, so are free to visit. We start our journey in Fitzroy Square, at number six which houses the new Tristan Hoare gallery. The current show, called Ensō, features two artists covering politics and minimalism. It made our recommended list last month. 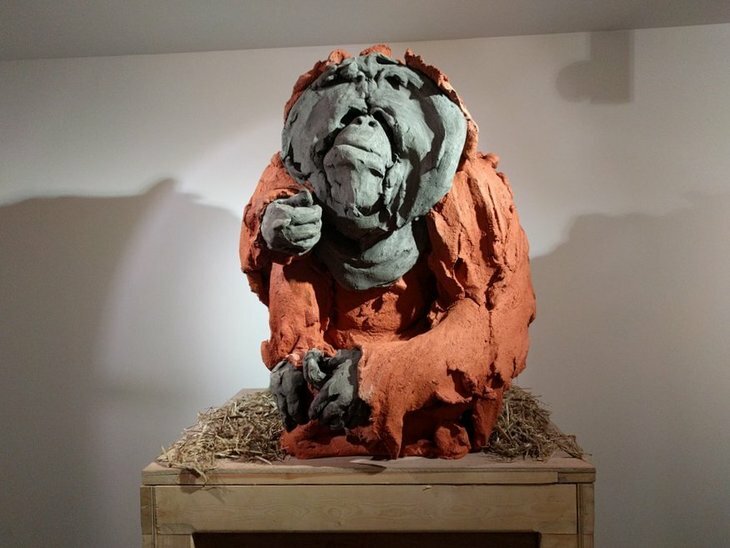 A beautifully sculpted clay orangutan by Stephanie Quayle. Currently residing at TJ Boulting. We then head south to Fold Gallery on New Cavendish Street. There, Tim Ellis has created projections, paintings and collages all pertaining to an object he has buried. It's possible to decode the information in each art work to locate his secret hidden object. TJ Boulting is our next stop. Before stepping in, take a moment to look at the sign that gives the gallery its name — it is for TJ Boulting & Sons, gas and electrical engineers established in 1808, who must have inhabited this building some time ago. Inside the gallery are the fantastic clay sculptures of Stephanie Quayle. A giant version of Jenga has endangered species of monkeys perched on it, while the other room contains four forlorn looking orangutans sat atop the kind of crates they would be shipped in. It's an environmental message conveyed by beautifully crafted sculptures. Rathbone Street is home to Rosenfeld Porcini, which houses one of the best exhibitions on this tour. 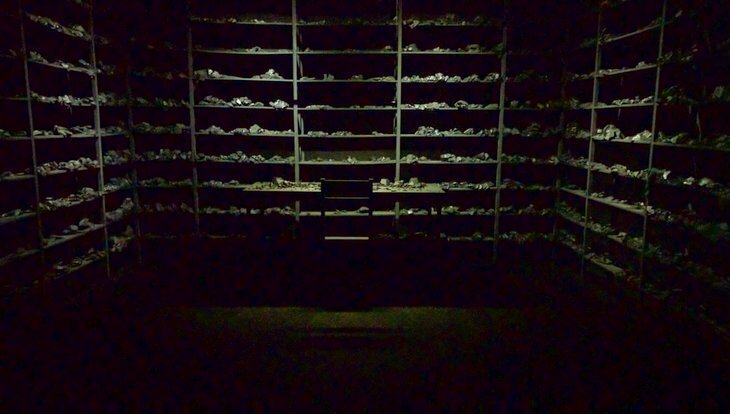 Levi van Veluw has created a 'crazed collector's space', with boxes on the wall containing black fragments of rocks, and a desk filled with wooden balls in something akin to a maze. But the real treat lies inside a darkened room. Allow your eyes to adjust and you'll find yourself surrounded by shelves filled with objects, headed by a desk filled with fragments. A mixture of mystery and allusions to the arcane make this an awe-inspiring show across two floors. Head a couple of roads over to see the ceramic sculptures of Takuro Kawata at Alison Jacques Gallery on Berners Street, for pieces that look like they're still evolving — though into what is left to our imagination. That ends our Fitzrovia section, but there's plenty more to see in Mayfair as we cut across Oxford Circus to continue our exploration. First stop is Blain|Southern in Hanover Square. 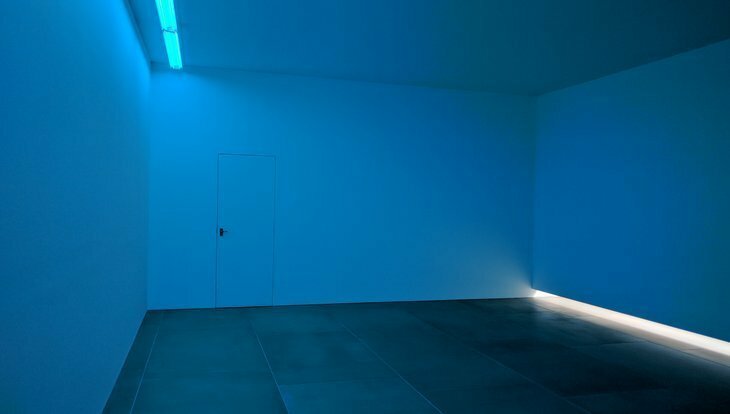 A Bruce Nauman room is filled with blue light, but natural light also creeps in through a gap at the bottom. This means the colour and feel of the room will vary depending on what time of day you visit. It's brilliantly meditative, best experienced when there aren't too many people inside the room. We then wander along Brook Street to a new gallery called Kamel Mennour, where you can see the work of Latifa Echakhch. A set of broken bells is sprawled across the floor. This political work becomes clear when you learn of the artist's French-Moroccan heritage — the bells of freedom have been broken apart as anti-immigration and Islamophobic sentiment spreads across Europe. Next up is Timothy Taylor Gallery for an immersive virtual reality experience by Shezad Dawood. We've already reviewed it so won't dwell on it too much here — just make sure to book ahead to avoid potential queues. 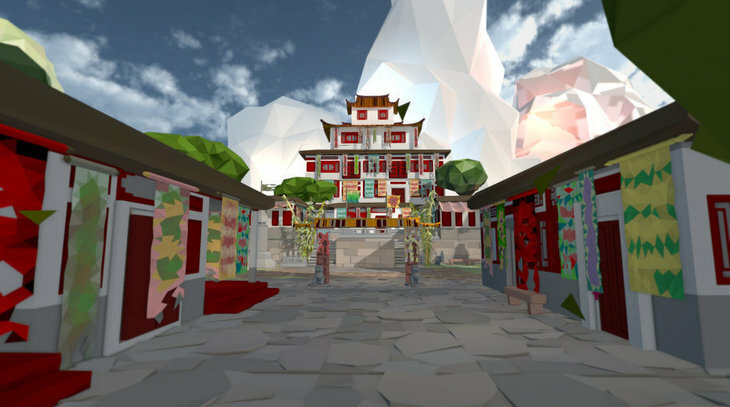 There's still time to catch the brilliant VR experience created by Shezad Dawood at Timothy Taylor Gallery. 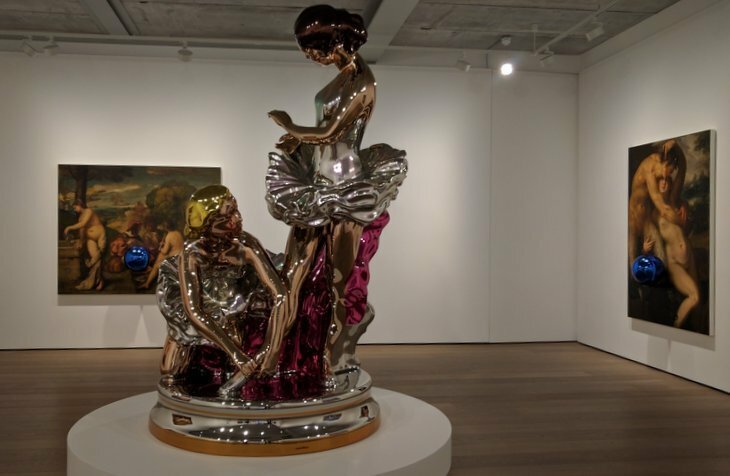 Jeff Koons is inhabiting another brand new gallery — tucked away just off Grosvenor Square, Almine Rech has opened a lovely new space. We thought the Koons show at Newport Street Gallery was hit and miss, but prefer his latest works. Spheres are placed in front of copies of Old Master paintings. The reflective qualities of the spheres question whether contemporary audiences see themselves in these paintings like viewers did when they were first made. If that's not your cup of tea there is some classic Koons here too, with shiny ballerinas just begging to be Instagrammed. Classic shiny Jeff Koons, but we really like his new work as well. It's in Almine Rech's new gallery. If this has all got too conceptual there are a few more traditionally-styled artists next up on the list. 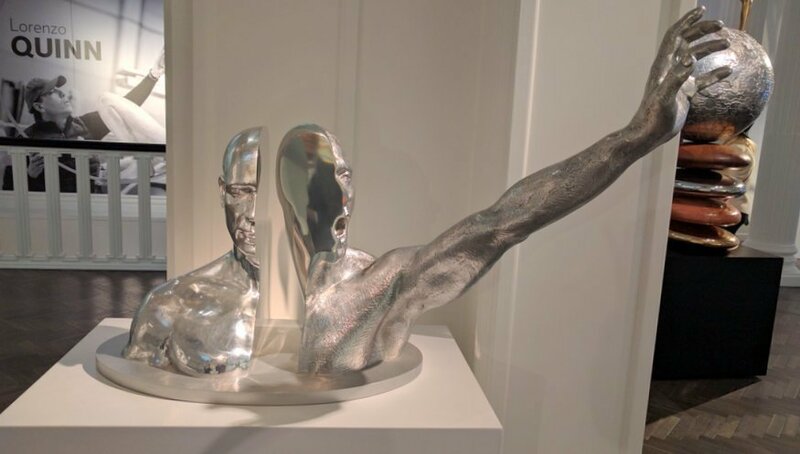 Nick Bibby creates beautiful bronze sculptures of animals and mythical creatures at Sladmore Contemporary, while Lorenzo Quinn is obsessed with painstakingly sculpting the human figure at Halcyon Gallery, and there are some great Picasso works on paper over at Omer Tiroche. If abstract is more to your taste then a few doors down from Halcyon Gallery is another new exhibition space, Olivier Malingue. The gallery is displaying the subtle gestural works of Korean artist Cho Yong Ik. Subtle marks made on uniform paintings using his thumb make for a contemplative and meditative experience. Over on Cork Street are fantastic optical illusions in the works of Patrick Hughes at Flowers, and one street over on Old Burlington Street you can see the sculptures of Yinka Shonibare at Stephen Friedman. Shonibare takes on the Venus de Milo and Michelangelo's David and covers them with an African design. The history of art may have been seen through Western eyes, but we're now in the age of multiculturalism. 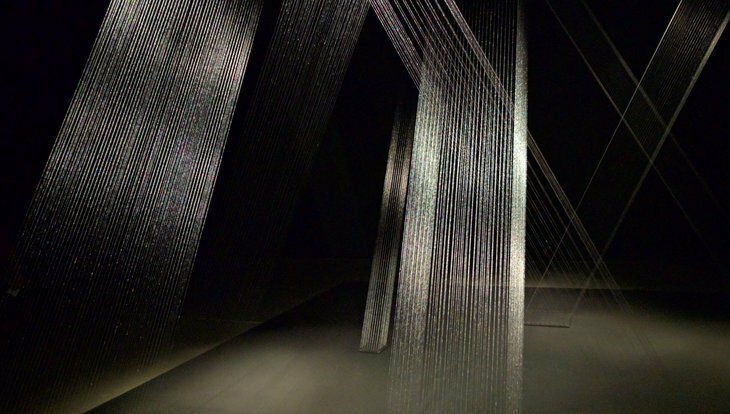 This installation by Lygia Pape is spellbinding and we could sit in front of it for hours. One more street over is Savile Row and the two giant galleries of Hauser & Wirth. Mike Kelley has taken inspiration from Chinese-American subculture to create two massive installation pieces based on Chinese architectural elements — look out for the secret grotto at the back of his elaborate wishing well. The other Hauser & Wirth gallery contains something special in the form of a beautiful work by Lygia Pape. Silver threads stretch from floor to ceiling and are lit dramatically so they glisten. We could easily sit for hours in front of them. Old Bond Street hosts the nail-based sculptures and paintings by Gunther Uecker at Dominique Levy, and a fantastic collection of Italian kinetic art at M&L Fine Art. At the latter, poking and prodding is actively encouraged (hurrah!). 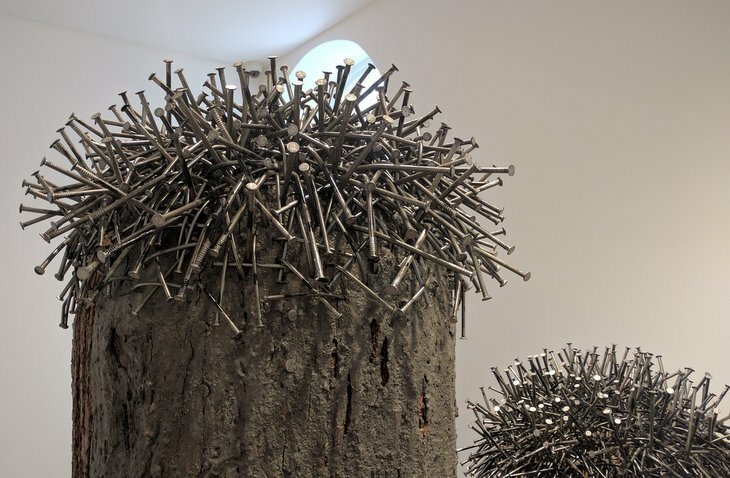 Gunther Uecker has created sculptures and sculpted paintings using nails. Check out the work at Dominique Levy. Mazzoleni on Albemarle Street contains two Italian giants in the form of Lucio Fontana's slashed canvases facing off against the delicate balanced sculptures of Fausto Melotti. They're two contrasting artists who complement each other very well. We then cross south of Piccadilly to see a Vanitas exhibition at Colnaghi — expect skulls in both the paintings and the sculptures. Then back past Green Park station to end at Hignell Gallery, where we find the sumptuous curves in the sculptures by Helaine Blumenfeld — a natural successor to Moore and Hepworth if there ever was one. It would take a superhuman effort to cover all these in one go so we suggest splitting the guide into bite-sized chunks and working through them over a course of weeks. Alternatively, click through the links and select your favourite five or six to visit. Even the two furthest apart galleries are only 30 minutes away from each other at a strolling pace, so it's easy to cover the full breadth of the guide. 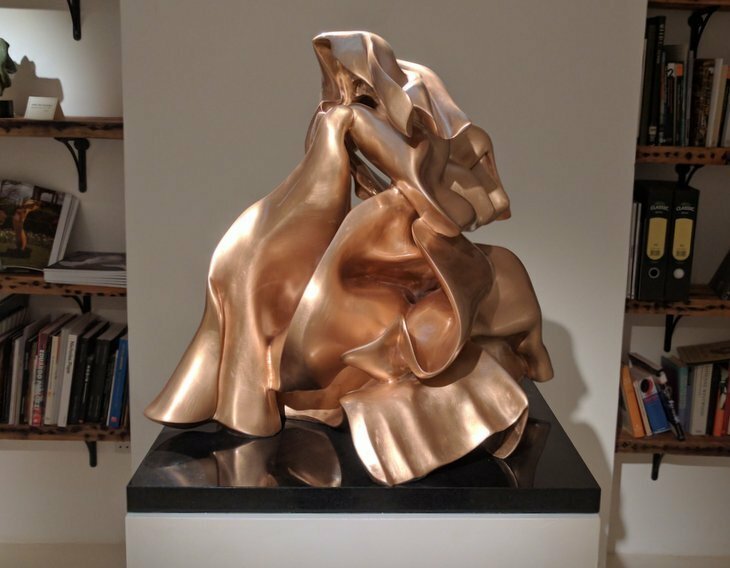 A graceful curved sculpture by Helaine Blumenfeld, at Hignell Gallery. Some of these galleries are not on the ground floor so can be hard to locate. Don't be intimidated by bells that have to be buzzed, just tell them you're there to see the exhibition and they'll be happy to let you in to have a look around. Thankfully the snootiness of Mayfair galleries is largely a thing of the past now. Bear in mind some of these exhibitions run for a few weeks to many months from now so check ahead to ensure the exhibition is still on. We've only picked our favourite exhibitions and there are many more in the local area. For a comprehensive list see a website like ArtRabbit or Galleries Now. These galleries all have a rotating selection of shows, so you can add yourself to their mailing lists on their websites for news of future exhibitions. All exhibitions listed are free to visit with the earliest ending on 21 October and the longest run stretching until January.